Washington severed relations with Cuba on January 3, 1961 and launched its economic embargo against Havana the following year. Its intended target was to transform Cuba’s political system from being sympathetic to Moscow’s brand of Communism to one more harmonious with the Cold War ideology being proselytized by the White House. However, most regional specialists now dealing with the embargo issue, after forty-eight years in operation, agree that it has not been particularly effective in persuading the island leaders to take steps toward the democratization of the country. Instead, it only has served to damage Washington’s economic, diplomatic and national-security interests affecting Cuba as well as the remainder of the region. During most of the last half century, discussions aimed at normalizing relations with Cuba have been rare and mainly unproductive. Due to Obama’s optimism for political change toward Cuba during his presidential campaign, there was considerable hope that the sterility and selective indignation that had characterized U.S. policy toward Havana would be altered in a more constructive direction. But his election did not by any means serve to initiate a paradigm shift in U.S.-Cuban relations, and after a year, one could say that when it came to change in Latin America, the direction of the new administration was more in reverse than in fast-forward. Once hopeful attitudes and expectations are now disintegrating, and as a result, there is a growing continuum of hostility between the United States and Cuba. Meanwhile, Washington, if anything, is becoming more isolated from much of Latin America than meaningfully connected to it. This growing animosity was underlined when news surfaced that Cuba had not been eliminated from the State Department’s State Sponsors of Terrorism list, which would be issued in its finalized form in April. Scandalously (given the paucity of incriminating evidence in recent years), Cuba has held a prominent position on that infamous list since 1982, and its ancient tenure in this category represents the second-longest in duration after Syria, despite the Cuban government’s futile protests that it does not in any form deserve to be stigmatized in this manner. September 18, 2007: Cuban Foreign Minister Felipe Pérez Roque reported on the Cuban Embassy’s website that damages caused by the U.S. blockade against his country add up to more than eighty-nine billion dollars. February 19, 2008: Fidel Castro resigns as Cuba’s president. December 18, 2008: Raúl Castro responded to Obama’s requests of freeing political prisoners by saying: “These prisoners you talk about—they want us to let them go? They should tell us tomorrow. We’ll send them with their families and everything. Give us back our five heroes. That is a gesture on both parts,” referring to the convicted “Cuban Five” spies. The five men were arrested by the FBI and indicted by a prosecuting U.S. federal attorney of espionage and conspiracy to commit murder. The Cubans defended themselves by arguing that they were part of a Cuban island network attempting to stop anti-Castro U.S. based organizations from their continuous anti-Havana acts of sabotage, violence, and manufacturing propaganda. January 20, 2009: Barack Obama becomes the forty-fourth President of the United States. January 21, 2009: The New York Times reported that Obama signed executive orders directing the CIA to close its Guantanamo operations within a year. April 13, 2009: Obama lifted restrictions on travel and money transfers to Cuba for Cuban-Americans. This effectively reversed one of his immediate predecessor’s restrictive policies toward Cuba, but in the grand scheme of things it was a small gesture whose impact soon wore off. April 17, 2009: The Foreign Policy Association reported that although Raúl Castro expressed his willingness the previous week to discuss “everything” with the United States, Fidel quickly followed up by clarifying that his country will discuss, but not back down, on any issue. April 18, 2009: While meeting with Dominican Republic President Leonel Fernández, U.S. Secretary of State Clinton asserted that previous foreign policy institutions toward Cuba had failed. April 18, 2009: Voice of America News reported that Obama had called for a new beginning between the U.S. and Cuba as well as seeking “an equal partnership” with Latin American leaders during the Summit of the Americas in Trinidad and Tobago. April 30, 2009: Raúl Castro made use of the advent of the UN’s NAM (Non-Aligned Movement) forum by declaring that “Cuba will not make ‘gestures’ to the United States, because Cuba is not the aggressor. It is not Cuba that has pursued the [irresponsible] financial transactions carried out by North American banks; it is not Cuba that has a military presence in the United States against the will of the citizens of the country . . . therefore, it is not Cuba that has to make goodwill gestures.” Raúl further stated that Cuba was ready to speak on all subjects, but on equal footing, without any questioning of the nation’s sovereignty or of its social and political systems. May 30, 2009: The Washington Post reported that Jorge Bolaños, the head of Havana’s Interests Section in Washington, formally accepted offers made by the U.S. to restart talks previously halted by the Bush administration, regarding legal immigration, terrorism, drug trafficking, and mail service. June 4, 2009: The Organization of American States voted to lift Cuba’s suspension from the Washington based organization; however, Cuba will need to make steps toward democracy in order to rejoin. As a result, Cuba rejected OAS membership. July 14, 2009: The Christian Science Monitor reported that the U.S. and Cuba held a discussion during a UN meeting dealing with immigration and national security issues. September 4, 2009: The Department of the Treasury’s Office of Foreign Assets Control amended the Cuban Assets Control Regulations which now allow for more travel, unlimited remittances and the ability for U.S. based telecommunications businesses to operate in Cuba. September 14, 2009: The White House released a statement informing that Obama has extended the U.S. trade embargo for a year. October 28, 2009: CNN reported that the UN has condemned the U.S. embargo against Cuba which, passed by a vote of 187-3. December 3, 2009: Alan P. Gross, a veteran development consultant who was assisting a State Democracy program, was detained by Cuban authorities. 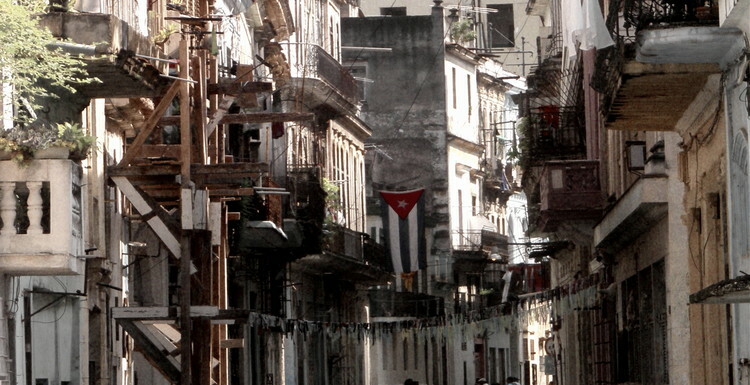 The program distributes laptops and cell phones as well as provides internet connections in Cuba. He stands accused of conducting an espionage operation. January 3, 2010: Cuba is one of the four countries designated by the United States as a State Sponsor of Terrorism. January 15, 2010: Reuters reported that the Cuban government opened its airspace to allow U.S. planes to fly over Cuba to assist Haiti after Haiti is struck by a massive earthquake. February 3, 2010: The Obama administration proposed spending $20 million on programs designed to bring democratic change in Cuba. February 5, 2010: Eight congressional Republicans wrote to Clinton calling for the cancellation of Cuba migration talks after the arrest of Alan Gross. February 19, 2010: A Migration meeting was held in Cuba, led by Principal Deputy Assistant Secretary for Western Hemisphere Affairs Craig Kelly. February 23, 2010: The LatinNews Daily reported that Orlando Zapata Tamayo, a Cuban political prisoner, died from an eighty-five day hunger strike to protest prison conditions in a Cuban jail. February 24, 2010: Raúl Castro’s stated that he “laments” the death of Zapata. BBC World News called this statement “unprecedented” and “a rare expression of sorrow by Cuba’s leadership” toward political activists, because in the past Havana has refused to acknowledge such developments. While President Obama acknowledged that the policies made by prior U.S. administrations that were intended to democratize Cuba have come to no avail, he has not put to work a policy aimed at constructive engagement. Although he has been chief of state for over a year now, he has done little to fulfill his campaign promise to meet with Cuban leaders and take necessary steps toward normalizing ties with Cuba. His less-than-significant move to free up remittances allowed to be sent to Cuba as well as lifting travel restrictions against Cuban- Americans visiting Cuba reveal themselves as merely a reversal of nuisance regulations implemented by George W. Bush. If Obama intends to live up to the hype he initiated during his campaign in terms of thawing an otherwise fallow relationship with Cuba, he needs to address a much longer and larger restrictive strategy towards U.S.-Cuban policies than just those put into effect by the previous administration. Furthermore, his executive orders regarding Cuba are not being enforced. On January 21, 2009 he signed orders instructing the CIA to close Guantanamo Bay; a year later, it remains open and Reuters reported that the deadline has been extended to an additional three years. Obama has ordered that the release of all political prisoners held in Cuba as a reoccurring condition to regain ties. It has been indicated that Raúl Castro is willing to release anyone of importance to the U.S. if the White House sees to it that the Cuban Five are freed. International support against the imprisonment of the Cuban Five remains strong. On January 28, 2010 three Argentinean men climbed Mount Aconcagua, the second tallest mountain in the world, to display a banner that read, “Obama, free the five Cuban heroes now!” The United Nations defended the Cuban Five, stating that the trial was not impartial; it happened in South Florida where anti-Castro sentiments are strong and harsh punishment for Castro supporters is routine. On October 10, 2009 a judge decided that the sentences were excessive and reduced them for three of the five. Antonio Guerrero’s sentence was reduced from a life sentence to a twenty-year term, due to insufficient evidence. The sentence reductions reflect negatively on the U.S. criminal system and raises doubt that their right to a fair and speedy trial was acknowledged. If the United States truly wishes to have better ties to Cuba, the prompt release of prisoners in both countries will stimulate change. By far the most damaging action taken by an administration supposedly trying to re-establish relations with Cuba was to abrogate the U.S. Practice of almost automatically placing Cuba on the State Department’s State Sponsors of Terrorism list. According to Peter Kornbluh of the National Security Archives, a non-governmental research library located at George Washington University, the reason for Cuba’s inclusion on the list is punishment for not participating in Washington’s global War on Terror. This accusation is far from legitimate since Cuba has laws against terrorism. In addition, being on the list prohibits Cuba from receiving U.S. foreign assistance, permission to export goods to the U.S., and requiring special licensing requirements for businesses exports to Cuba. But one would hope that the U.S. possessed a justifiable reason for maintaining Cuba on its list rather than an ideological commitment to political values. For twenty-eight years, Cuba has languished on the list with no action toward democratic change or presenting credible evidence of Cuba supporting the War on Terror. Keeping Havana on the list for another year with no concrete evidence that it benefits the United States leads to the conclusion that it only negatively affects Cuba. Recalling Obama’s words on May 23, 2008 concerning U.S. arrogance towards Latin America, it would appear that the U.S. is in need of a pressing review of a hemispheric policy that brings with it vital new ideas.